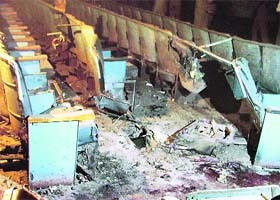 Six persons were blown to pieces and 25 injured, some of them seriously, in a bomb blast and subsequent stampede at the Shingar cinema hall near the Samrala chowk here this evening. The bomb was believed to be an RDX device. Id celebrations went sour for several Muslim families of the Madhopuri area and Dhoka Mohalla, both predominantly Muslim areas, as several members had gone to watch a Bhojpuri film at the Shingar cinema where the bomb blast took place. 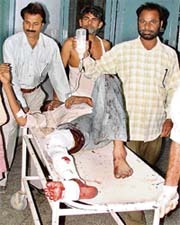 One of the injured at a hospital in Ludhiana on Sunday. Do hockey players deserve a better deal? Eleven devotees were killed and 15 injured in a stampede at the famous Mahakali Temple atop Pavagadh hill here today. “The stampede occurred between devotees who were coming down the hill and those who were climbing their way up”, resident district collector of Panchmahals R.K. Rathod said. Ahead of defence minister A.K. Antony’s visit to Moscow beginning Tuesday, India and Russia in a major breakthrough have ironed out differences over cost escalation of armament systems. In a deal, New Delhi has now agreed to pay an annual cost escalation of five per cent as against 2.8 per cent originally worked out on all arms contracts worked out with Russia earlier. In the backdrop of the spectre of uncertainty looming over the nuclear deal, the government has given a two-year extension to Anil Kakodkar, secretary in the Department of Atomic Energy. Kakodkar, who closely monitored the negotiations for the deal, was due for retirement in November. This is his third extension. Eleven persons, hired to construct a wooden bridge in the proposed Posco plant site, were being held captive for the past five days, Posco Pratirodh Sangram Samiti claimed today. “We have held 10 workers and a driver, who were engaged by the rural development department for building a wooden bridge near the site for Posco’s proposed steel plant, as captive,” PPSS president Abhaya Sahu told PTI over phone. Rallies and demonstrations are nothing new in this crucial Hindi heartland, which witnessed a series of agitations from the JP movement in the 1970s to reservation issue in the recent past, the echoes of which were felt in national politics too. But it was a different rally by school students of Aurangabad. Pen, it is said, is mightier than sword and the schoolchildren there have proved that in letter and spirit. Chief Minister Parkash Singh Badal and SGPC chief Jathedar Avtar Singh will hold a meeting with union home minister Shivraj Patil in Mumbai tomorrow to finalise the arrangements for the proposed tercentenary celebrations of the “completion” of Guru Granth Sahib that falls next year. The SGPC has asked the Centre to give global coverage to the event.